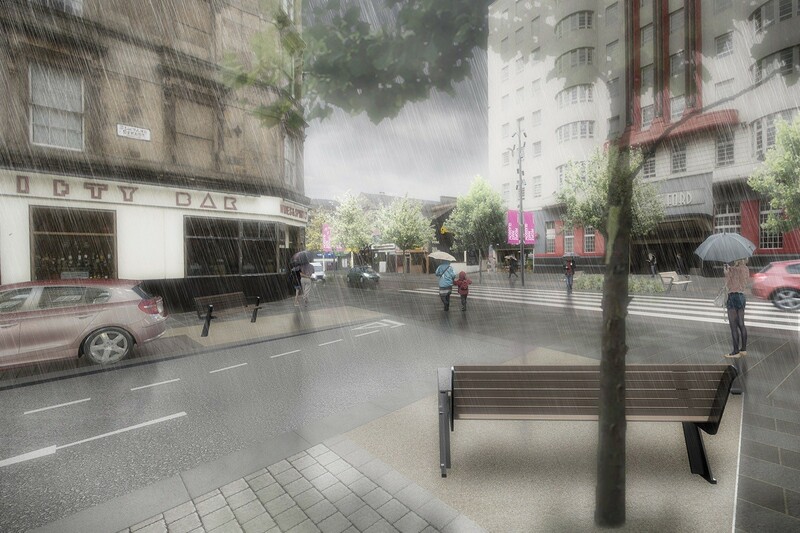 Glasgow City Council have stepped forward to deliver a £115m public realm upgrade of Sauchiehall Street with the aim of prioritising pedestrians and cyclists on the shopping drag. Improvements will be carried out to a section running from Charing Cross to Rose Street from this summer, with completion expected 18 months later. This will see existing pavements widened, decluttered and paved with Caithness stone in addition to the introduction of new trees, seating and a two-lane cycleway. All new street lighting and bike stands will also be introduced. Kerbs will be lowered for three bus stops and two taxi ranks with a view to better integrating the street with the wider city centre. A far bolder commitment is expected for Charing Cross itself with plans being formulated to deck over the M8 motorway to form a new city centre park. Is this not all a bit basic for what this street needs?? - new trees - seating - two-lane cycleway - street lighting - bike stands? Last time I looked at an atlas, Glasgow was still a Northern European city and not Las Ramblas. 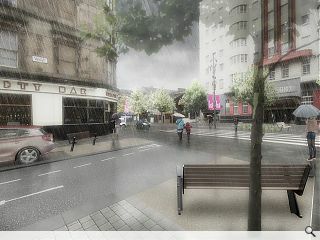 I'm liking the empty benches and p×××××× rain. A realistic image for a change. About time something was done to stop the rot. Like the proposals to make the pavements wider and tree line the street. Awnings the full stretch of the street would be good given our weather. With the exodus of shops , the street may have to reinvent itself as an entertainment hub and more hotels. Better than having empty shop units. And we need to stop charging for parking to take on the out of town shopping malls. The malls are having it all on their own way at the expense of the city centre....sheltered from the weather and free parking. How fabulous! So delighted to hear this as I walk up Sauchiehall Street and cycle on regular basis. Thank you to all involved in this great project! #PeopleMakeGlasgow I'm very grateful ??? ?